There comes a time when we will all experience grief, loss, pain, and sadness. Today is yet another day for that. Amongst all the excitement and planning for my graduation (in 3 days, yay by the way) tragedy struck my family. I went for a long bike ride this morning, going farther than I usually go and earlier than I usually go. I felt great, my body just kept going, not tiring. I didn’t know what it was, but I felt alive. When I came home, I did my usual signing on to skype to talk to my mom. As soon as she called me and said hello, I knew something was wrong. I had heard that tone before, several times, both from her and from my dad. My stomach flipped, and I waited for the bad news. She told me my grandmother passed away just a few hours ago. I’m not one to show emotion freely. I don’t cry in front of people, and I have a hard time crying alone. The only time I cried when I got bad news was with the passing of my dog. Usually it takes me time to process the news, to feel the depth of the hurt and pain. Writing helps that. I feel the tears coming now, as I write out these words. I’m sad. I knew it was coming, but I didn’t expect it to come so soon. I’m more sad that I can’t be there for my mom. I’m sad for the pain she’s feeling and for the guilt I know she feels for not being there with my grandma when she died. I know time heals all wounds. My grandma is now at peace. She is no longer suffering from narcolepsy or Alzheimer’s, she is in no pain. The pain that’s felt is by those left behind. Grandma, we did not share nearly enough time together. I didn’t know you as an adult, but I know you were there for me when I was a bratty child. No matter what, I loved you. Mom loved you, and your son loved you. I truly thought I’d get to see you again. Rest in peace grandma. Thank you for being a part of my life. I’m on my last week of tray 19. Next week I’m on to 20! Yay! My ortho told me to get my cavity checked out, but she doesn’t want me to actually have a filling as it could affect how the aligners sit. She wants me to find out if the cavity can wait to be filled until the treatment is over. In other news, I now must wear elastics on both sides! What joy….Oh well. That be all for now! 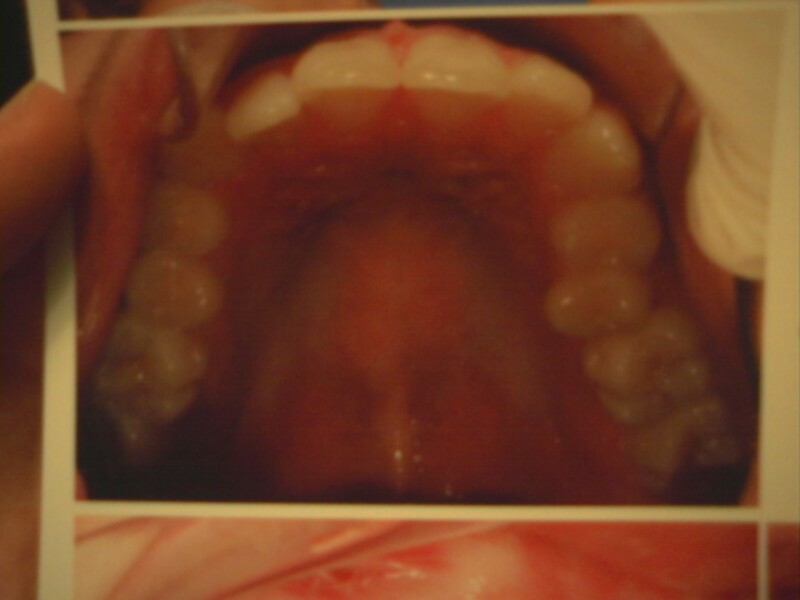 I’ve put the 19th trays in early just to help my teeth not hurt at night and tomorrow. Right now they feel alright, not too tight, not painful. The bottom ones were once again a pain to put in, but I got ’em on there. The good news with tray 19 is that it’s halfway to the finish line! The midway mark of my treatment! 19 more trays and my teeth will be straight! I can’t wait! I gotta say, 19 trays have gone by fast. Only 19 more! Words/blogs cannot express how good that feels! Stay tuned for updates! Hope your treatments are going well! 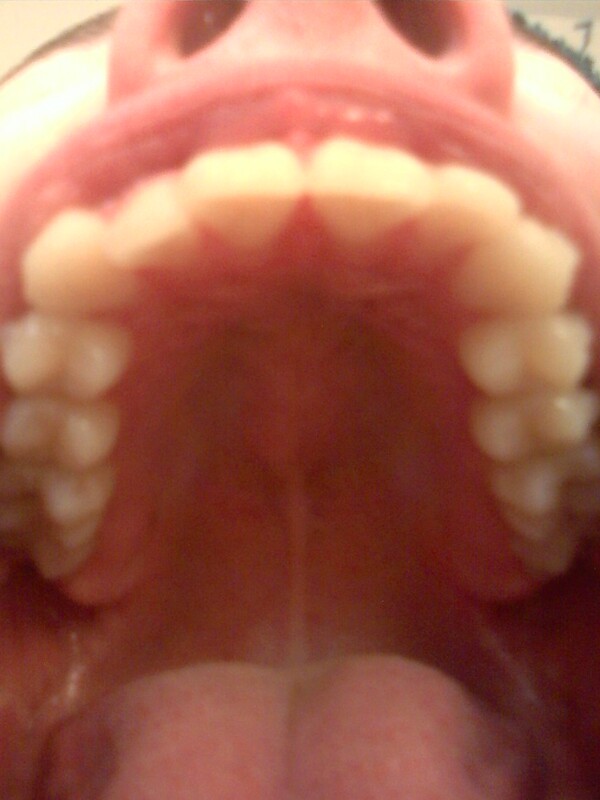 Just took more photos of my teeth. I won’t post the bottom ones because the now picture is REALLY blurry…and you can’t really see a difference. But! Here are the tops! I noticed it today while brushing my teeth that The one side of my mouth isn’t crushing against my tongue anymore. It’s nice! I apologize for the up-the-nose shot =).